The Tiger’s Nest Bhutan monastery hike is one of the most popular hikes around the world. 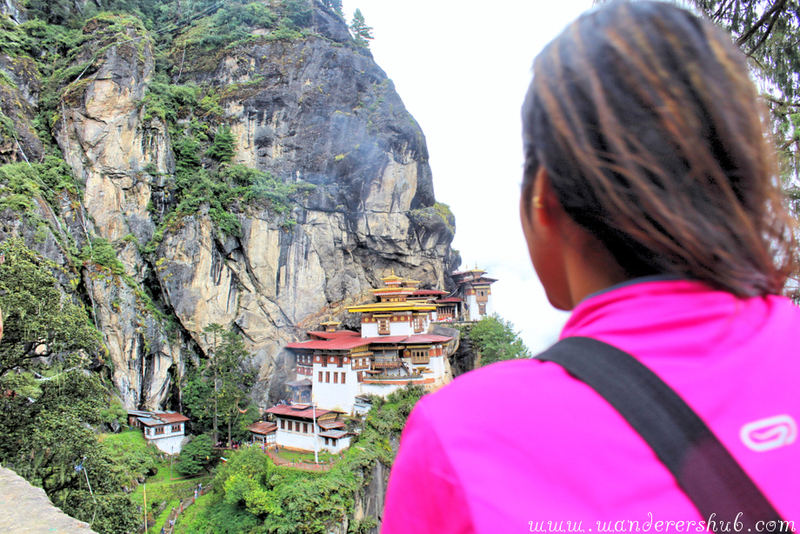 Also called as Paro Taktsang, hiking this trail was actually the reason why Harsh and I had planned our trip to Bhutan. 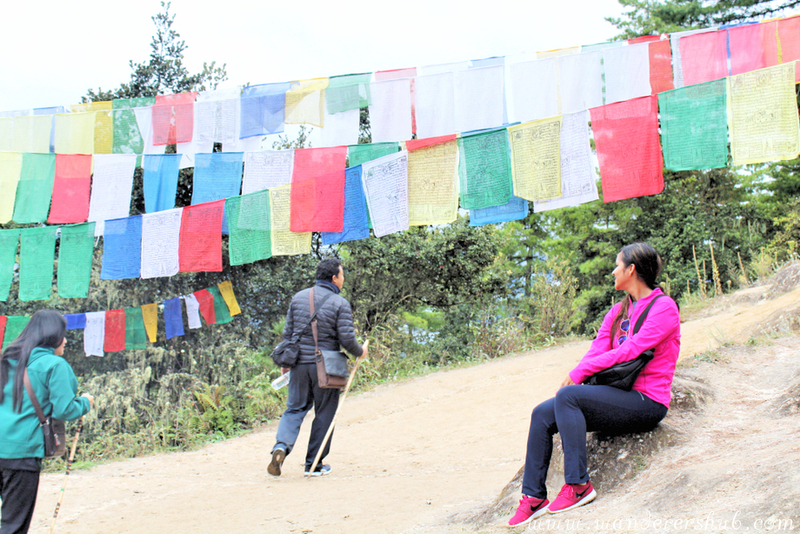 Nonetheless, the 2.5-hour hike deposited us on a striking expedition in the gorgeous backdrop of cliffside of Paro Valley which made us befriend Tiger’s Nest Bhutan monastery. We started early at 8 in the morning only after reconfirming from our driver that it was fairly pleasant weather for the Taktsang monastery hike. We could see globules of clouds from far away but were reassured that it wouldn’t rain, which is why we left our rain gear in our car (still believing that local people would know better about the weather). 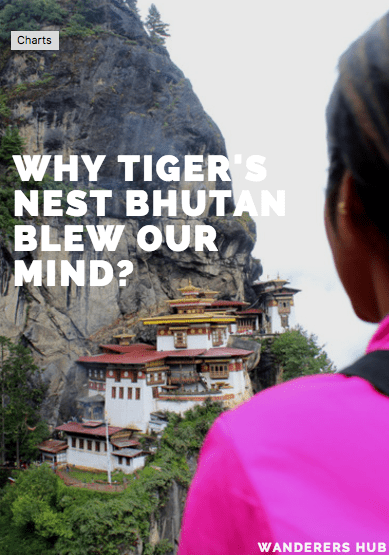 Tiger’s Nest Bhutan and we got off on the wrong foot – dramatic climate change, improper planning, no rain gear – an epic Bhutan monastery hiking plan gone wrong. Choosing the main trail is all about gradual ascents and less strenuous hiking, which we’d suggest you take, and even opted for. 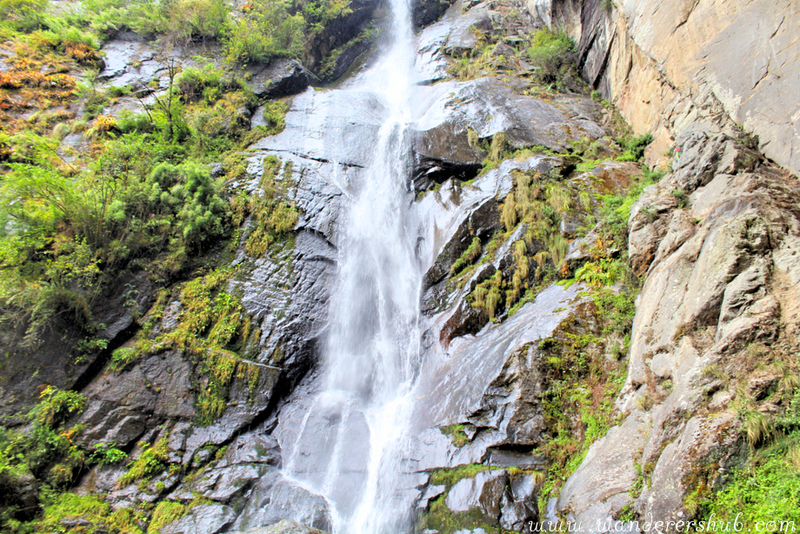 The side trail cuts down the hiking time relatively but is a lot steeper and only suggested for regular trekkers. It can be really straining for the beginners, believe us. Usually, monks are the ones who are more comfortable taking this route as they are adept with it. Don’t blindly follow them as it can leave you gasping for breath later on. This trek has three prime landmarks – the cafeteria, first viewing point, and ultimately the monastery. The Cafeteria marks your half-way through the trek and you can enjoy a quick lunch here (it’s quite expensive so bringing along your refreshments would be a nicer idea). For the foreigners with their tour guides, the lunch is covered. So, relish appetizing Bhutanese delicacies only if your pocket permits. Then comes the viewing point from where you get the first good view of the monastery. In our case, the monastery got so badly covered in globules of clouds that it was rather disappointing for us to click the pictures. But we were not let down by that, instead, we waited for half an hour for the clouds to move away and could eventually take some pictures. A lot of trekkers actually returned from this point to my utter surprise. 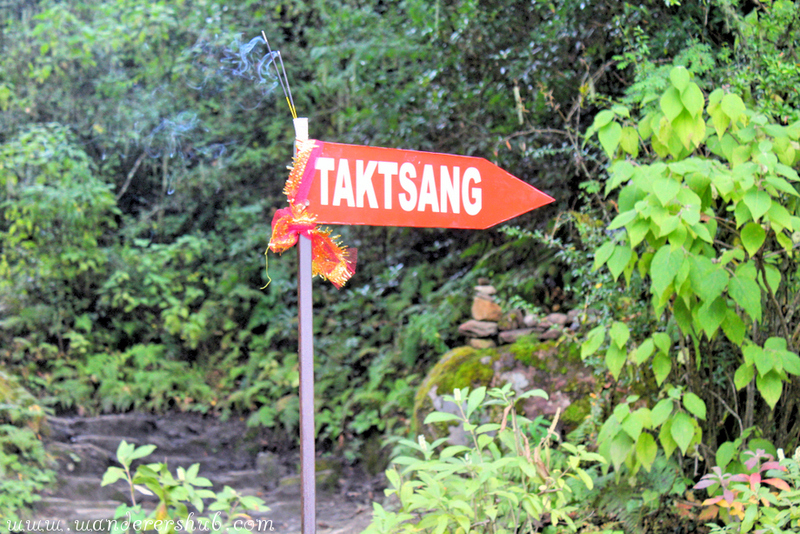 Finally, the monastery which entices all trekkers from a distance and the continuous chanting of mantras keeps the pace going. Our driver dropped us at the starting point where a small group of traders were selling wooden sticks and trinkets. We did not consider taking a horse/pony and instead did the entire trek on foot. 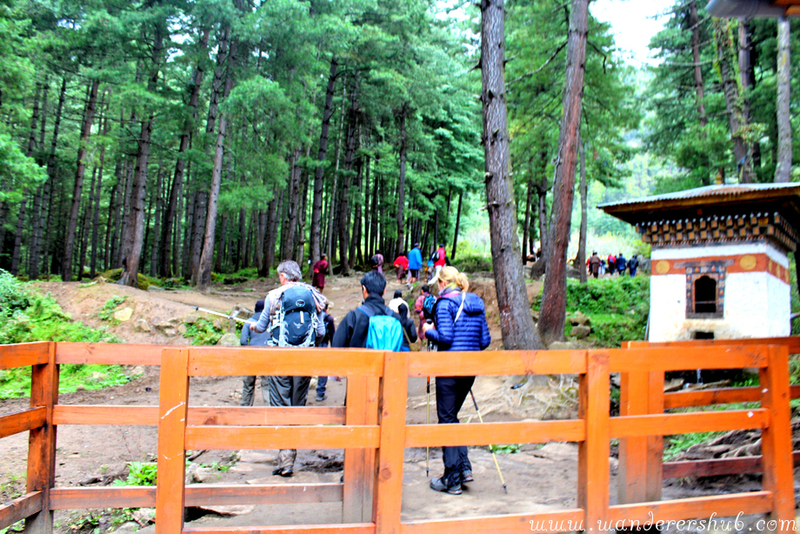 The trek takes you through a patch of dense pine forest and ascents that start soon after you’ve hiked 50m. 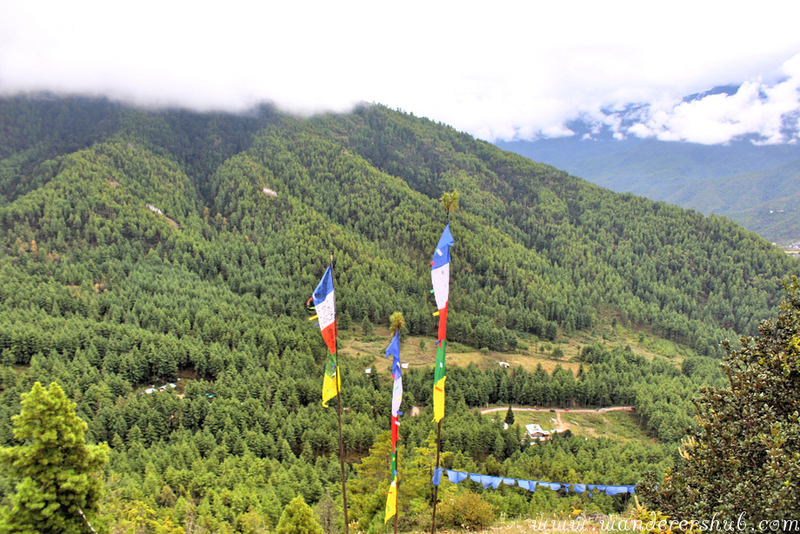 Soon the trail went on to become arduous from steep to a way steady climb up to the Paro Monastery. The first small stop on the Tiger’s Nest Bhutan hike was the ridge which was marked by numerous prayers wheels and flags as well as a chorten. Within 45 minutes, we were past the cafeteria, and we didn’t stop there as we weren’t tired. “We’re almost there,” other trekkers kept assuring us and themselves! It was really nice to climb to the Paro Monastery with so many people, all from different countries and of different religions. We reached the second viewpoint and it began to rain cats and dogs. So, we decided to relax a bit over there and waited for the rain to stop. 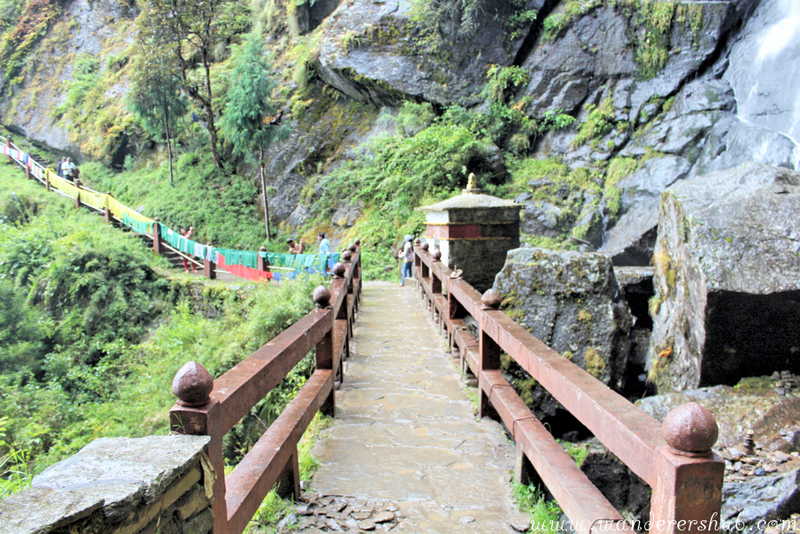 Also, there was the most difficult path to tread in front of us – one last brutal flight of stairs which were blanketed in clouds (though offering an aura of heaven to the Tiger’s Nest Monastery Bhutan). 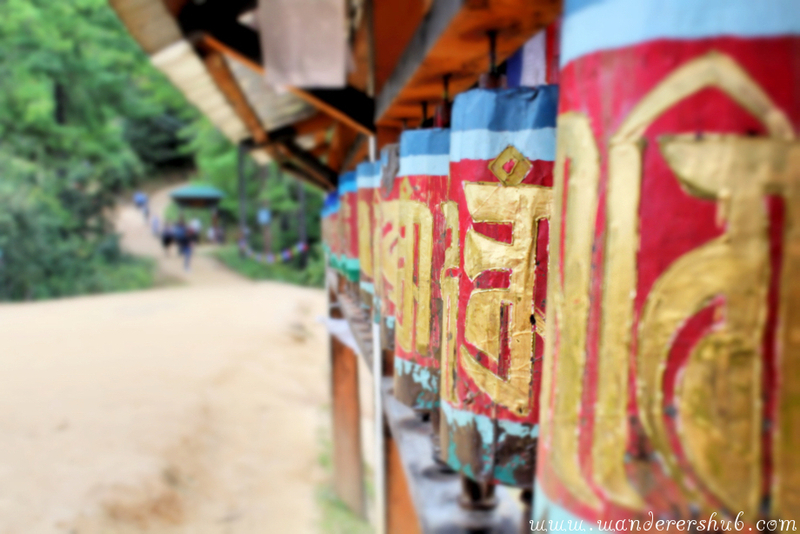 The remaining stretch was wrapped beautifully in prayer flags, which was a site to behold. Even the view of the Paro Monastery was clear then, which gave us a chance to click ’n’ number of pictures. Within 15 minutes, we were there at the monastery, though our legs felt like jellies by then. Our determination didn’t deter and we finally were upfront with the beauty. And trust me, no matter how many times you might have seen and appreciated the beauty of Tiger’s Nest Bhutan monastery in pictures, but the feeling of being up close and personal with it is so different. There are strict conditions for entry inside the pilgrimage site. You cannot take shoes, cellphones, cameras, or any kind of electronic equipment inside. You need to deposit everything at the counter outside the monastery. Also, you cannot act smart with the security guards as they make sure you do not smuggle your cameras or cell phones inside. Tiger’s Nest Bhutan Monastery remains closed from 1:00 P.M – 2:00 P.M as lamas have their lunch at that time. Inside the monastery, we were greeted with tea and biscuits. On procession to the main temple, there was a small room where the deity is worshipped. There are chambers where Buddhist icons are offered food and money. It felt divine, for sure! It was extremely difficult for us to come downhill as the entire stretch which was way too steep had become slippery after the downpour. In fact, I slipped there twice and sat down at one point of time, deciding that I wouldn’t be able to go back ever. A lot of local people kept telling us horror stories of other trekkers who were slipping as well, which scared me to no ends. Help came out unexpectedly. A very sweet local Bhutanese friend, Thinley, asked to give his help to me. Harsh was able to trek down easily after that because I was able to move down easily with Thinley’s help. We both couldn’t thank him enough for his gracious attitude. And by the time we got back down, we were totally doused in mud. This experience was something we would never forget! We suggest that you keep Tiger’s Nest Bhutan monastery hike for the last day as it will drain all your energy, and you will need plenty of bed rest afterward. It won’t be wise wasting the next day in bed rather you can make the most by going for the hike on the last day of your trip and take rest on flight back. Best months to plan your trekking trip to Bhutan would be March, April, May, June, September, October, November. There are a lot of things you need to keep in mind when getting ready for the trek. Good hiking shoes: However good or bad the climate might be, don’t forget to wear good hiking shoes with thick socks. Strictly stay away from sandals, heels or bathroom slippers. Clothes: They won’t let you inside the monastery in short pants or capris. You need to be modestly dressed to go inside the pilgrimage site. Perhaps Harsh made a huge mistake here and ended up sitting outside the monastery even after such hard work. Read about the blunder he made, here. Refreshments: There’s just one cafeteria that too after you are halfway up to Taktsang so carry your water and refreshments. We would advise you to carry some protein bars and chocolates to keep your energy level in check throughout the Tiger’s Nest Bhutan monastery trek. Hiking poles: If you have hiking poles, bring them along. And if you don’t, then you can buy a wooden stick from the parking lot area for 50 NU | 1USD where a lot of vendors stack up these sticks and handmade stuff. Rain Gear: If it can happen to us, it can happen to anyone. So, there’s no harm in carrying a rain gear. Think how much weight it would add? There wasn’t any stark hint that it could rain but it did! Have you been to Tiger’s Nest monastery? Let us know your travel experience in the comments below! Despite the weather and mud this sounds like an amazing trip! I would love to visit Bhutan someday. All of my travels have been in the US, but traveling internationally has long been a dream of mine. Paro Taktsang looks absolutely incredible. I would probably get stoked of its beauty and be busy taking pictures. It sounds like a painful leg workout (blame it on my lack of exercise.) Nevertheless, it is undoubtedly worth it! What a beautiful post 🙂 I love your photos so much!! they make me to wanna go there. Thanks for sharing with us!! This trek sounds incredible! Bhutan has fascinated me for years and I really hope to go here some day! Those colourful flags are really beautiful. I suppose with views that amazing, all your tiredness must’ve quickly been wiped away! I agree with proper hiking boots – saves a lot of trouble. Great post! Wow the photos are out of this world. I would definitely love to go to Bhutan someday. It’s extremely beautifully. Thanks for sharing. I have heard of Bhutan for many years and have always dreamed of seeing this monastery, you really made it come alive for me and the photos are just amazing. 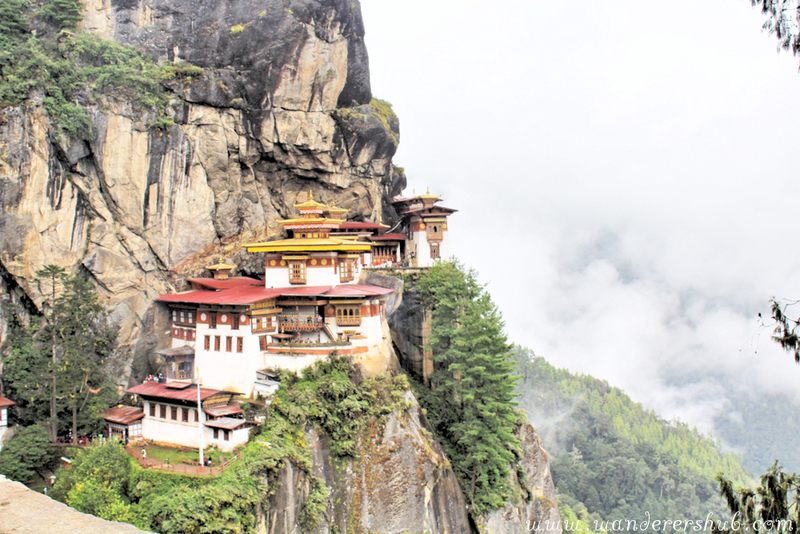 I always have a soft spot for Bhutan — I’ve been eyeing this country for a while now! 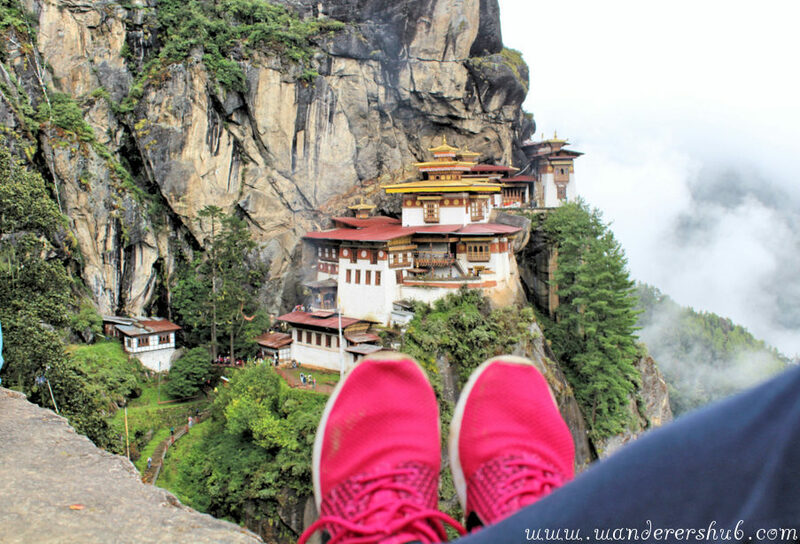 Unfortunately, the cost to visit Bhutan is not cheap 🙁 thanks for the photos and story! I enjoy reading it. Bhutan has been ‘on my list’ so to speak for years and years now; it just looks like such a beautiful and serene country! Your journey to and from the monastery sounds like quite an adventure – I always find the worst part about doing treks such as these are the stories you’ll inevitably hear about how people (who you’re always told are more experienced than you) have fallen and seriously injured themselves or gotten killed. Like, that’s not going to help with my already severely shaken nerves! It sure is pretty mind blowing just by reading from your experience and looking at the photos! Hopefully one day I could take this trail. I’d love to have divine trips like this, usually these are life-changing! Wow wow and wow again! I had no idea there’s a place like this but daaaamn it’s beautiful! I just wrote it down on my travel list! Tiger’s Nest looks incredible and is deffo on my list! I thought Bhutan had high visa costs? All travelers (excluding Indian, Bangladeshi and Maldivian passport holders) who plan to visit Bhutan need a visa and have to book their trip through a licensed Bhutanese tour operator who will take care of Visa arrangements. Such stunningly beautiful temple set in a gorgeous location. I found your post very informative and useful. Thank you for the tips. I would defo add this to my bucket list but would use your tips. This looks like such an amazing and wonderful hike! Am definitely going to add it to my travel bucket list of things to do in the future. Unfortunately, I haven’t had the chance to visit Asia yet, but one day soon for sure! Wow, this adventure is so inspirational. 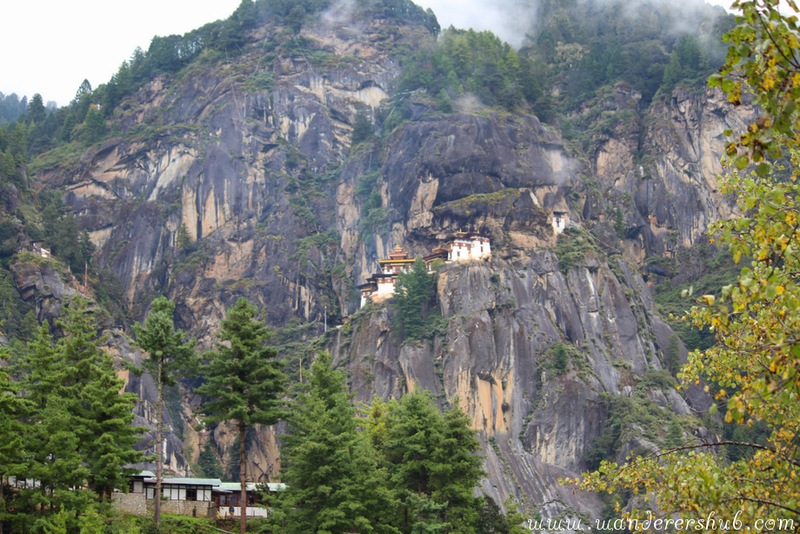 Bhutan wasn’t on my list before but it is now! The trek looks incredible. Bhutan is really a fascinating place. The view of monastery is great! I really hope to go here someday. I have been to Bhutan twice, but unfortunately unable to explore this area. It looks awesome. I will definitely visit this place, the next time I go to Bhutan. Hey Saurabh, then you must return for PARO. It’s the most gorgeous city of Bhutan. Plus the Tiger’s Nest Monastery that’s so dreamy. wow – those monks must be so fit! And the reward is amazing. A fantastic and very detailed article. I haven’t been to Bhutan but it so gained a few more points after reading your post. wow1 I’ve seen so many photos of this place, and the trek is right up our alley for adventure hikes. It looks spectacular! I’ve learned my lesson on rain gear in the past, as well as not being properly prepared for just how difficult a climb would be, but those views are the reward for sure! such a cool place to visit! this building is amazing! thanks for your photos and post. This place is amazing! And now it’s on my bucketlist. I’ve pinned it for later. Thanks! That must be scary! I don’t have the courage to do such a thing for I have fear of height. I admire your perseverance and passion for extreme adventure. I have seen pictures of the Tiger’s Nest but haven’t researched it enough yet to know about the trek. It must have been an incredible adventure, and what a feeling once you actually reached the place. Bhutan is getting more and more popular and I am anxious to go there. Your story about the local saying that the weather was good reminded me of a hiking in Grenada when a local said that the trail wasn’t muddy. After losing our shoes in the deep mud, we decided that local advice isn’t always trustworthy. I will add Tiger’s Nest to my list of must-do hikes. Bhutan is high on my list to visit. Unfortunately I’ve heard that it could be a bureaucratic and expensive journey to get the visa to Bhutan. Maybe not for you – I would be interested in learning how you managed to get it, and how much you spent on required tours etc. Tiger’s Nest is a dream destination. The external pictures of it are so inspiring but we always wondered why we never saw internal photos. Thanks to you guys, we now know that electronics are forbidden. You always include such useful info. Thanks. What did you do with your cameras and cellphones etc when you went inside? Is there a safe place to leave your stuff? Also is it easy to get a picture from the exterior? Thanks for sharing your experience. It looks and sounds incredible. I gotta get myself up to the viewpoint. Great photos! This has been on my list for a long time now! Despite the rain, this hike sounds and looks amazing. That does sound like a rather harrowing trip back down! Glad you made it safely. Thanks for the post! I’m stoked that you managed to get over a dodgy start to your Bhutan adventure. I’d love to visit this remote mountain kingdom, the landscapes would, as it did you, blow my mind. This is one of the places that I want to go most in my life! Thanks for outlining how I can make this a reality! I am planning to visit Bhutan this year and after reading this post, am very excited to go and see this beautiful country. The tips are very useful. Amazing pictures. I really want to visit Bhutan. The Tiger’s Nest looks amazing! Thanks for the tips about what to wear there. The trek sounds tiring but worth it for the view! I can see why the place blew your mind! Beyond stunning, and one of my dream places to see.Bhutan in general seems so happy, or, the people see cheery and genuinely joyful. Factor in the beauty of the land and you have a winner. I also dig the fact that you get some serious cardio on this hike. Right up my alley. Super post and super blog guys. As a Bhutanese, I couldn’t do justice to its beauty by taking such a good pictures. You have done it wonderfully perfect. 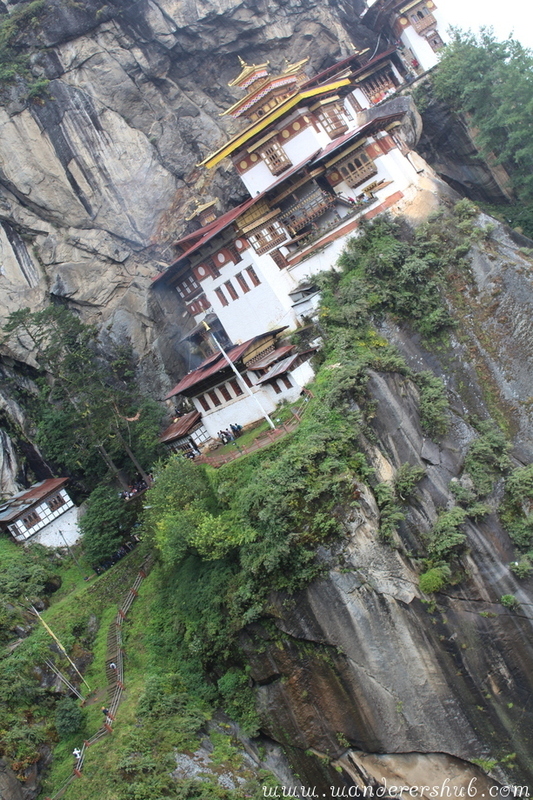 Taktsang looks more beautiful here. Tiger’s nest is one of the best travel Destination in Bhutan. I really like your blog post, amazing writeup, really valuable for the traveller.